Which country will be the next China - India or Vietnam? Some observers believe India has the potential to assume that role, while Vietnam is going to be the next South Korea. Such comments make India a fair-haired boy for some low-end manufacturers that want to move their production out of China due to rising labor costs. However, a recent labor strike has given investors a second thought when it comes to rushing into the emerging economy. An estimated 200 million people went on a two-day strike last week across India, media reports said, bringing the country to a standstill. The strike was organized by 10 unions, which alleged that some policies announced by the Indian government go against the interests of Indian workers. Indian laws guarantee workers the right to unionize. It is important to protect workers' rights and improve their working conditions, but we have to strike a balance between employee welfare and economic development. India's primary strategy should be to promote economic growth. It will be an optimal result for New Delhi if this strategy doesn't totally go against workers' interests. If economic development is like baking a cake, then welfare distribution is like dividing it. A bigger cake means everyone can get a larger piece even if the rules of how to divide the cake remain unchanged. In the initial stage of its industrialization process, India may need to put more focus on development than improving employee welfare. Global history tells us that many developing countries undergo a development bottleneck because they seek to offer the high-standard social welfare of Western countries when they're still in their initial stage of development. In recent decades, rural migrant workers helped create the so-called China miracle, which led to the country becoming the world's factory. As a developing country, China can't offer high-standard social welfare to most of those migrant workers, but the country has lifted them out of poverty. Now the minimum wage for rural migrant workers has risen as a result of China's economic development. If India wants to be the next China, the country needs a young and well-educated work force with a strong work ethic. They may enjoy limited employee welfare when the country stands at its initial stage of development. The shortage of hard-working, skilled employees shows that India still has a long way to go in becoming the next China. 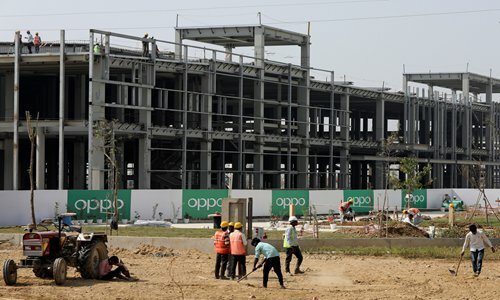 It is true that labor costs are now lower in India than in China, but multiple factors such as workers, infrastructure and laws are key obstacles for India's development.